Arctic ecology is the scientific study of the relationships between biotic and abiotic factors in the arctic, the region north of the Arctic Circle. This region is characterized by stressful conditions as a result of extreme cold, low precipitation, a limited growing season and virtually no sunlight throughout the winter. 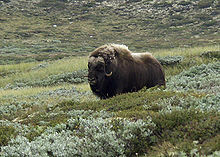 The Arctic consists of taiga and tundra biomes, which also dominate very high elevations, even in the tropics. Sensitive ecosystems exist throughout the Arctic region, which are being impacted dramatically by global warming. The earliest inhabitants of the Arctic were the Neanderthal sub-species. Since then, many indigenous populations have inhabited the region, which continues to this day. Since the early 1900s, when Vilhjalmur Stefansson led the first major Canadian Arctic Expedition, the Arctic has been a valued area for ecological research. In 1946, The Arctic Research Laboratory was established in Point Barrow, Alaska under the contract of the Office of Naval Research. This launched an interest in exploring the Arctic examining animal cycles, permafrost and the interactions between indigenous peoples and the Arctic ecology. 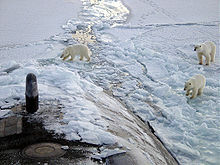 During the Cold War, the Arctic became a place where the United States, Canada, and the Soviet Union performed significant research that has been essential to the study of climate change in recent years. A major reason why research in the Arctic is essential for the study of climate change is because the effects of climate change will be felt more quickly and more drastically in higher latitudes of the world as above average temperatures are predicted for Northwest Canada and Alaska. From an anthropological point of view, researchers study the native Inuit peoples of Alaska as they have become extremely accustomed to adapting to ecological and climate variability. The effects of global warming in the Arctic, or climate change in the Arctic include rising air and water temperatures, loss of sea ice, and melting of the Greenland ice sheet with a related cold temperature anomaly, observed since the 1976. Related impacts include ocean circulation changes, increased input of freshwater, and ocean acidification. Indirect effects through potential climate teleconnections to mid latitudes may result in a greater frequency of extreme weather events, ecological, biological and phenology changes, biological migrations and extinctions, natural resource stresses and as well as human health, displacement and security issues. Potential methane releases from the region, especially through the thawing of permafrost and methane clathrates, may occur. Presently, the Arctic is warming twice as fast compared to the rest of the world. The pronounced warming signal, the amplified response of the Arctic to global warming, is often seen as a leading indicator of global warming. The melting of Greenland's ice sheet is linked to polar amplification. According to a study published in 2016, about 0.5 °C of the warming in the Arctic has been attributed to reductions in sulfate aerosols in Europe since 1980. Climate change feedback is important in the understanding of global warming because feedback processes may amplify or diminish the effect of each climate forcing, and so play an important part in determining the climate sensitivity and future climate state. Feedback in general is the process in which changing one quantity changes a second quantity, and the change in the second quantity in turn changes the first. Positive feedback amplifies the change in the first quantity while negative feedback reduces it. 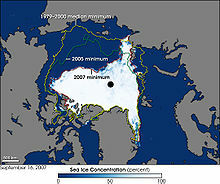 In recent decades, sea ice in the Arctic Ocean has been melting faster than it re-freezes in winter. The Intergovernmental Panel on Climate Change (IPCC) Fourth Assessment Report states that greenhouse gas forcing is predominantly responsible for the decline in Arctic sea ice extent. A study from 2011 suggested that internal variability enhanced the greenhouse gas-forced sea ice decline over the last decades. A study from 2007 found the decline to be "faster than forecasted" by model simulations. The IPCC Fifth Assessment Report concluded, with high confidence, that sea ice will continue to decrease in extent, and that there is robust evidence for the downward trend in Arctic summer sea ice extent since 1979. It has been established that the region is at its warmest for at least 40,000 years and the Arctic-wide melt season has lengthened at a rate of 5 days per decade, dominated by a later autumn freeze-up. Sea ice changes have been identified as a mechanism for polar amplification. Climate change adaptation is a pressing issue in Greenland. The term climate change describes long-term changes to the climate system. Since the 1950s a stark rise in global temperatures has been observed. As climate change, whether natural or anthropogenic, impacts the livelihoods of people across the globe, responses i.e. ways to prepare and adjust under changing vulnerabilities become important. Such responses are commonly discussed under the term adaptation, "the process of adjustment to actual or expected climate and its effects", as defined by the IPCC.